The Global Volcanism Program has no activity reports for Macá. The Global Volcanism Program has no Weekly Reports available for Macá. The Global Volcanism Program has no Bulletin Reports available for Macá. The Global Volcanism Program has no synonyms or subfeatures listed for Macá. 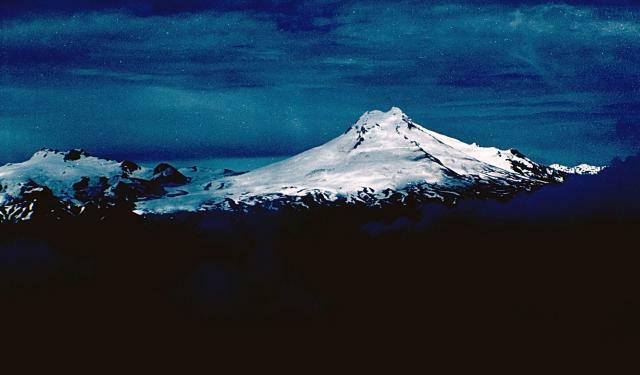 The glacier-covered, basaltic-to-dacitic Volcán Macá stratovolcano lies within a caldera and contains a summit lava dome. Five flank cinder cones and lava domes lie along a NE-trending fissure that extends 15 km from the summit SW to Bahía Pérez. The volcano lies along the regional Liquiñe-Ofqui fault zone, and a lava flow from a cinder cone at Bahía Pérez erupted as recently as between 1450 and 1670 CE. Gonzalez-Ferran O, 1972. Distribucion del volcanismo activo de Chile y la reciente erupcion del Volcan Villarrica. Instituto Geog Militar Chile, O/T 3491. Gonzalez-Ferran O, 1995. Volcanes de Chile. Santiago: Instituto Geografico Militar, 635 p.
Gutierrez F, Giocada A, Gonzalez Ferran O, Lahsen A, Mazzuoli R, 2005. The Hudson volcano and surrounding monogenetic centres (Chilean Patagonia): an example of volcanism associated with ridge-trench collision environment. J. Volcanol. Geotherm. Res., 145: 207-233. Naranjo J A, Stern C R, 2004. Holocene tephrochronology of the southernmost part (42° 30' - 45° S) of the Andean Southern Volcanic Zone. Rev Geol Chile, 31: 225-240. There is data available for 2 Holocene eruptive periods. There is no Deformation History data available for Macá. There is no Emissions History data available for Macá. 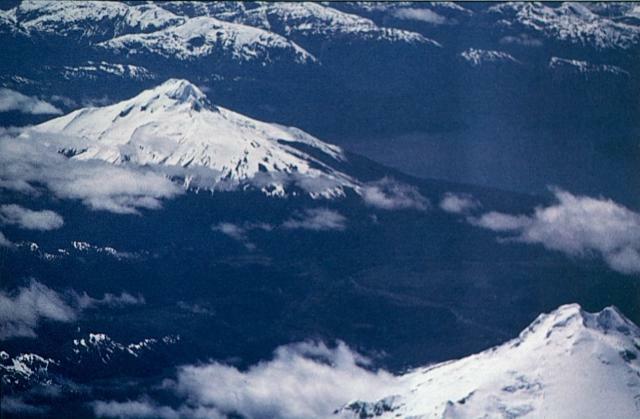 Volcán Macá, the highest volcano between Lanín and Lautaro, rises to 2960 m NW of Puerto Aisén. Little is known of the geologic history of this glacier-covered stratovolcano, which contains a summit lava dome and flank cinder cones. Photo by John Davidson, University of Michigan (courtesy of Hugo Moreno, University of Chile). Volcán Cay (upper left), is located east of Macá volcano (lower right) and NW of the town of Puerto Aisén. The basaltic and dacitic stratovolcano has an explosion crater that is open to the east, and about a half dozen explosion craters and pyroclastic cones lie along a fissure trending SW of the summit. Another 10 basaltic pyroclastic cones are located along second parallel fissure 5 km to the SE that is part of the major regional Liquiñe-Ofqui fault zone. Photo by Oscar González-Ferrán (University of Chile). 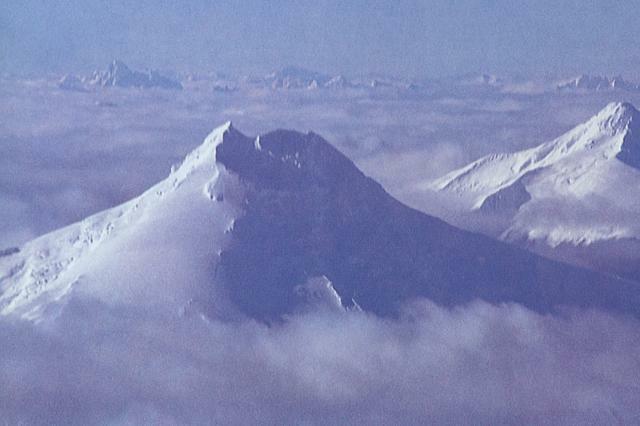 Snow-mantled Volcán Maca, the highest volcano between Lanín and Lautaro, rises to 2960 m NW of Puerto Aisén. This glacier-covered, basaltic-to-andesitic stratovolcano lies within a caldera and contains a summit lava dome. Five flank cinder cones and lava domes lie along a NE-trending fissure that extends 15 km from the summit. The volcano lies along the regional Liquiñe-Ofqui fault zone. Volcan Cay (far right) lies to the NE of Maca. There are no samples for Macá in the Smithsonian's NMNH Department of Mineral Sciences Rock and Ore collection. Large Eruptions of Macá Information about large Quaternary eruptions (VEI >= 4) is cataloged in the Large Magnitude Explosive Volcanic Eruptions (LaMEVE) database of the Volcano Global Risk Identification and Analysis Project (VOGRIPA).